Jogostempo.com might replace your homepage without your permission. These changes will be applied to Internet Explorer, Google Chrome, and Mozilla Firefox browsers. 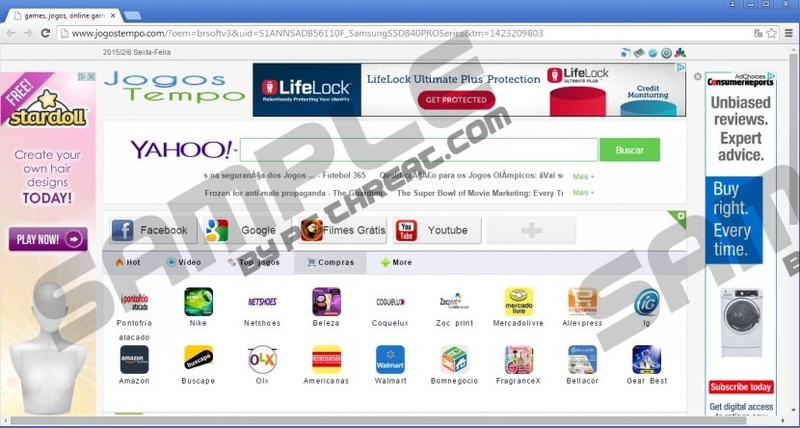 As Jogostempo.com can replace your homepage without your consent, it is often classified as a browser hijacker. The files of this browser hijacker are digitally signed by Beijing Gaojiaoxintu Technology Co., Ltd and it is primarily aimed at people living in Brazil. If you have already noticed the changes, we recommend getting rid of Jogostempo.com as soon as possible because this search engine is untrustworthy. We understand that this search engine looks very useful; however, we are 100% sure that it is not fully reliable. If Jogostempo.com has been already set as your homepage, there is no doubt that you have noticed that it is full of so-called easy-access links. It seems that this search engine not only helps users to access Facebook, YouTube, and other popular places on the Internet, but it will also allow them to access online videos and games. Actually, it is unclear whether you will be taken to really trustworthy websites after clicking on any of those easy-access links. Thus, we recommend that you refrain from doing that. The specialists at pcthreat.com have found out that Jogostempo.com will also provide users with advertisements. They might redirect you to unreliable websites as well, so it would be better to ignore them. As can be seen, there are several drawbacks associated with this search engine, so you should stop considering whether it is really worth deleting it. The specialists at pcthreat.com have shown that Gamegogle application will be installed alongside Jogostempo.com browser hijacker. This application leads to another version of the same search engine (gamegogle.com) and it will not do anything useful. What’s more, it is clearly evident that this search engine adds a background service for self-update. It is very likely that this browser hijacker has entered your system because you do not have any security tool installed on it. We highly recommend that you acquire a trustworthy tool as soon as possible because other serious infections might creep in your system in the future. It is possible to delete Gamegogle App via Control Panel; however, you will still see Jogostempo.com in the place of your homepage and the self-update service will not disappear anywhere. We highly recommend that you scan your computer with a trustworthy malware remover in order to fully remove this browser hijacker. SpyHunter is the tool that will definitely help you to remove Jogostempo.com browser hijacker. If you invest in this tool, it will protect your system from malicious software in the future as well. Right-click on the unreliable application. Find the program that you wish to remove. Tap Alt+T and open Internet Options. Click on the Advanced tab and select Reset. Put a tick in the box alongside Delete personal settings. Click Reset Firefox (or Refresh Firefox). Click the same button in the dialog box. Click Reset browser settings and select Reset. Quick & tested solution for Jogostempo.com removal.